Top: Chang’e 3 lander on the Moon, in an image taken by the Yutu rover. Images released by China’s official news agency show the lander, covered in golden foil, its solar panels open to generate power. In Chinese mythology, Chang’e is the goddess of the Moon. 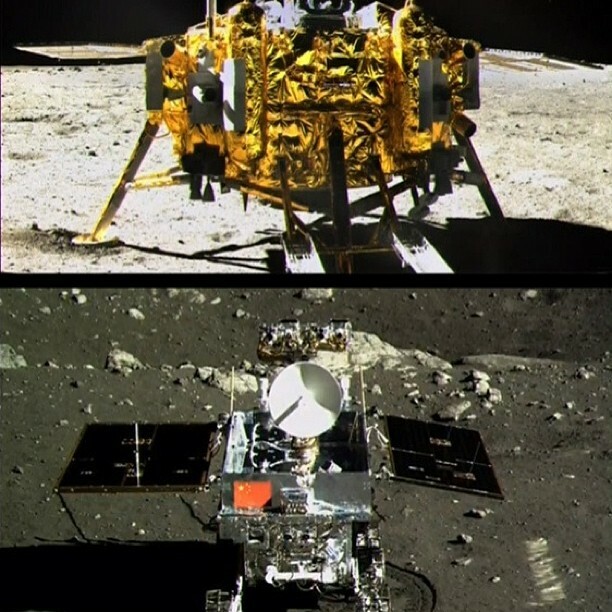 Bottom: Yutu on the Moon, in an image taken by the lander craft. Yutu, or Jade Rabbit, was Chang’e’s pet. Yutu’s tracks in the dark lunar soil appear after it rotated to show a red Chinese flag to the camera. On Dec. 14, the Chinese rover Yutu, fresh off its delivery truck, began exploring a flat, volcanic plain on the moon. Thirty seven years after the last spaceship landed gently on the moon, China joined the United States and the former Soviet Union in a consummate technical achievement. The rover will measure the mineral and elemental composition of rocks and soils. It’s too early to expect scientific results, but the mission did get us wondering: What have scientists learned recently about the structure and composition of our faithful companion? What’s new on a question that is first among equals: How come we have a moon? Some of the most exciting new results come from measurements of the moon’s gravity. Because gravity is an interaction between two masses, when the two GRAIL spacecraft orbited above areas with different density (and therefore different mass), their orbital paths subtly reflect the change in gravitational field. 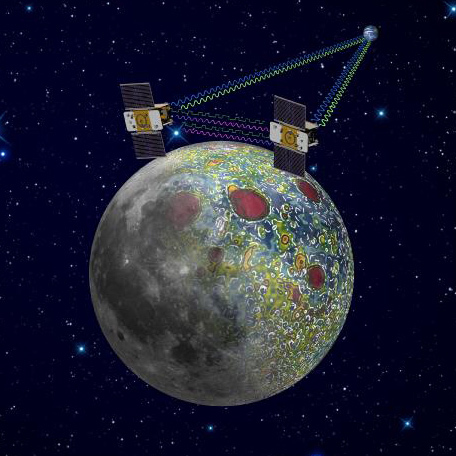 Tracking those orbits registers differences in density, which in turn can map out structures hidden under the moon’s battered surface. The twin GRAIL spacecraft (named “Ebb” and “Flow”) kept a close eye on each other after their 2011 launch. As the two ships circled the moon, they took precise measurements of local variations in lunar gravity. The GRAIL ships ran out of fuel and crashed into the moon on Dec. 17, 2012. Between March and May, 2012, GRAIL, the Gravity Recovery and Interior Laboratory mission, mapped gravity on the moon, and got a first internal picture of the moon. The project revealed volcanic landforms, impact basin rings and many bowl-shaped craters. 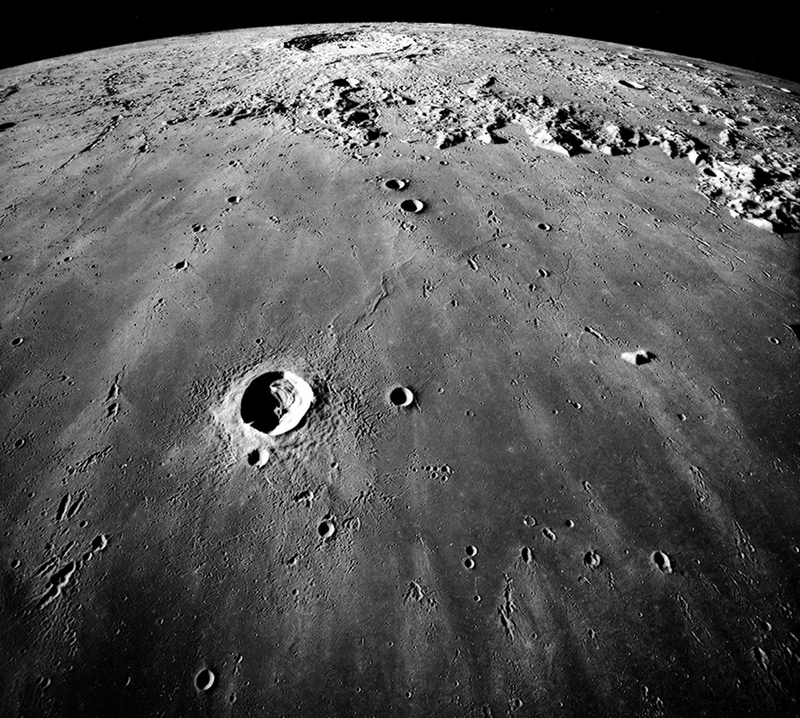 The moon’s crust turns out to be 34 to 43 kilometers thick, much thinner than expected. 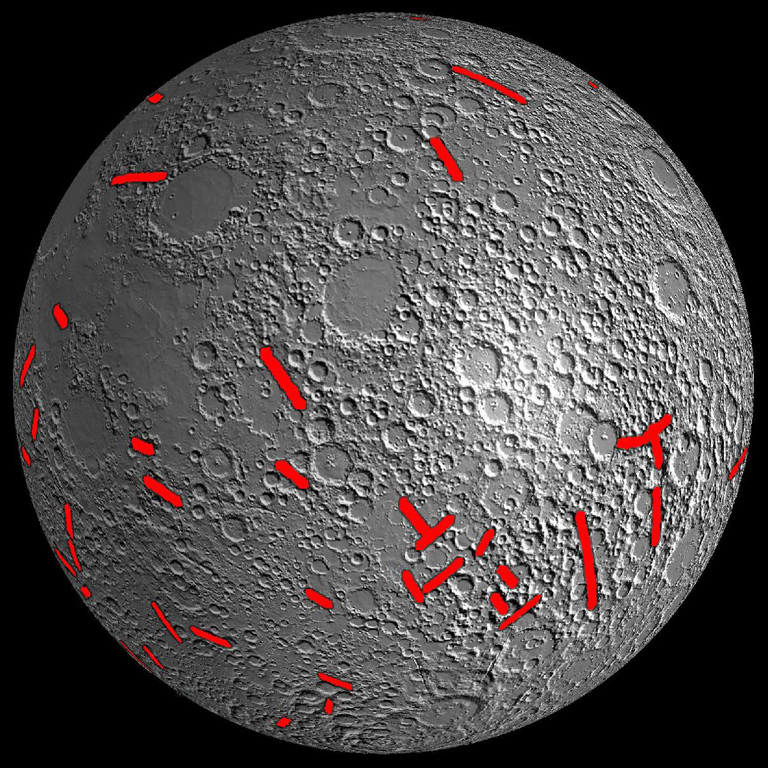 This image shows variations in the lunar gravity field on the far side of the moon. GRAIL’s measurements are three to five orders of magnitude better than previous data. Red: Mass excesses; Blue: Mass deficiencies. The far side has more small-scale detail than the nearside because it has more small craters. Most of the alterations in gravity result from features near the surface; GRAIL found its deep structure is rather homogenous, and likely full of fissures. The most ferocious attack, the “late heavy bombardment,” occurred roughly 4 billion years ago. “This is interesting for the moon,” Zuber says. “But … every other planet was being bombarded like this.” The incoming asteroids and comets carried their own range of elements. The fractures, meanwhile, affected how planetary bodies lose heat, and also formed pipelines so fluids can move through the interior. 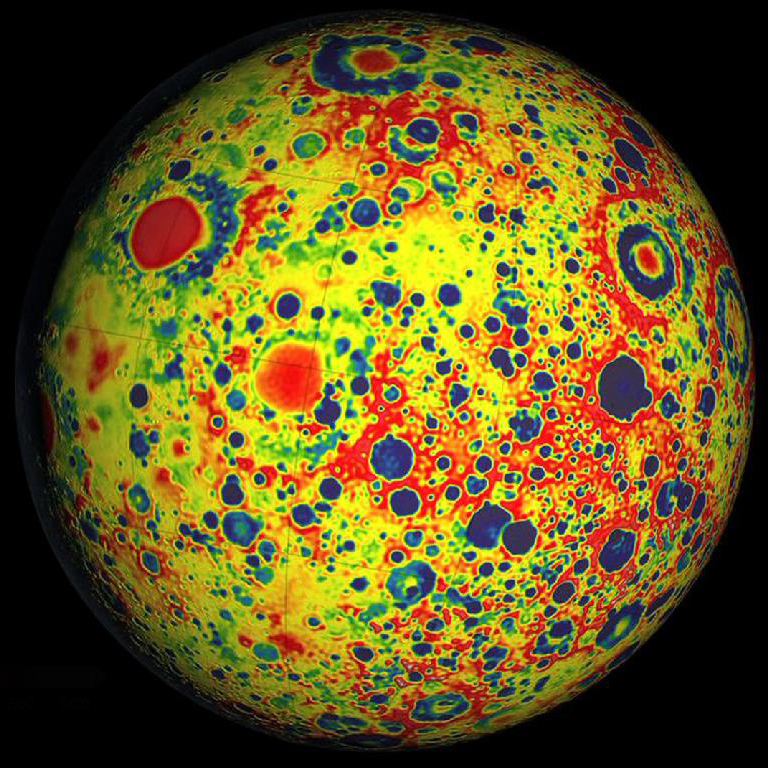 A long gravity anomaly (dots) caused by an unknown deep structure intersects the Crisium basin on the nearside of the moon. Colors on the gravity image (left) correspond to different strength of gravity. The impact partly destroyed the anomaly, so it must be older than the impact basin. At right, a laser altimeter showed no sign of the gravity anomaly, highlighting the value of the gravity study for exploring the moon’s internal structure. All of this data rested on some amazingly precise measurements as the GRAIL twins travelled more than 200 kilometers apart. How precise? GRAIL detected changes in the movement of the two spacecraft as small as several hundredths of a micron per second. MIT’s press office says a snail moves 20,000 times faster than that! GRAIL also found some huge internal structures — which geologists call dikes — that show that the moon’s radius grew 0.6 to 4.9 kilometers while its rocks were still hot enough to ooze. No such evidence of expansion would remain on tectonically active Earth. This side of the moon contains the giant dikes — cracks filled with solidified magma — that are up to 480 kilometers long and up to 40 kilometers wide. The dikes formed as the moon expanded during the first billion years of its history, when its radius increased as much as 5 kilometers. 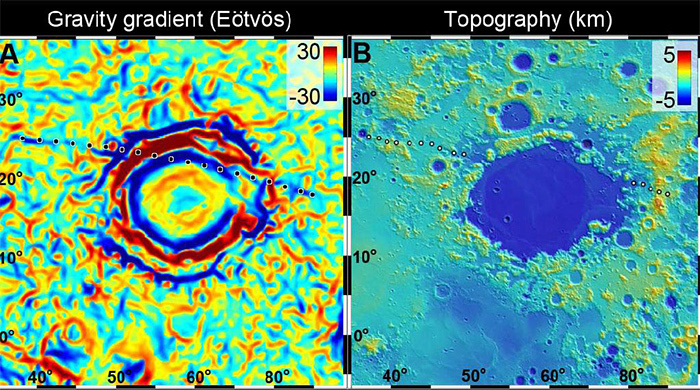 The topographic map was built by the Lunar Reconnaissance Orbiter. And that, ultimately, explains some of the fascination with GRAIL. While Earth’s continents and ocean floor are constantly moving and being recycled, the moon has been remarkably stable since its molten rock cooled and solidified billions of years ago. It’s like a time capsule. The “Genesis Rock,” collected from the lunar highlands during Apollo 15, was thought to be a piece of the moon’s primordial crust. In a 2013 paper in Nature Geoscience, a University of Michigan researcher reported traces of water inside the rock. Water always interests planetary geologists, who see it (on Mars, anyway) as a possible key to ancient life. On the moon, water could grow food or be decomposed into oxygen for breathing and hydrogen for fuel. Both are essential for supporting human colonies. Evidence for water came from several studies, including one that looked at dust raised after a spacecraft was deliberately crashed into the shadowy wall of a crater, where water could remain frozen in the intense cold. The water found in lunar soil may have been delivered to the moon by comets or meteorites. A study reported last year pointed to another possible source: the solar wind, a stream of particles driven from the sun. Protons — hydrogen ions — in the wind could combine with oxygen on the moon to form water. More alarmingly, the recent discovery of water inside moon rocks may destabilize the hippest hypothesis of the moon’s origin: a stupendous assault on Earth by planetary-size body called Theia. Water, presumably would boil off and be lost during the cataclysmic collision — so how could it still reside deep on the moon? 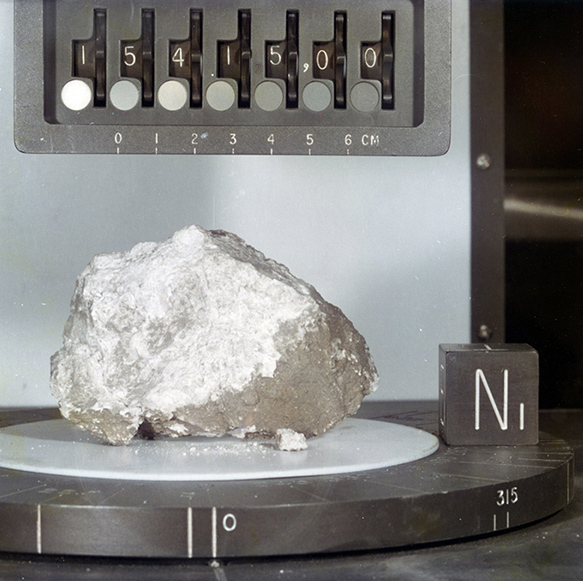 Recent studies with better instruments prove that samples collected more than 40 years ago by Apollo astronauts remain a priceless source of information about the moon. Apollo astronauts retrieved 382 kilograms of samples on six missions. 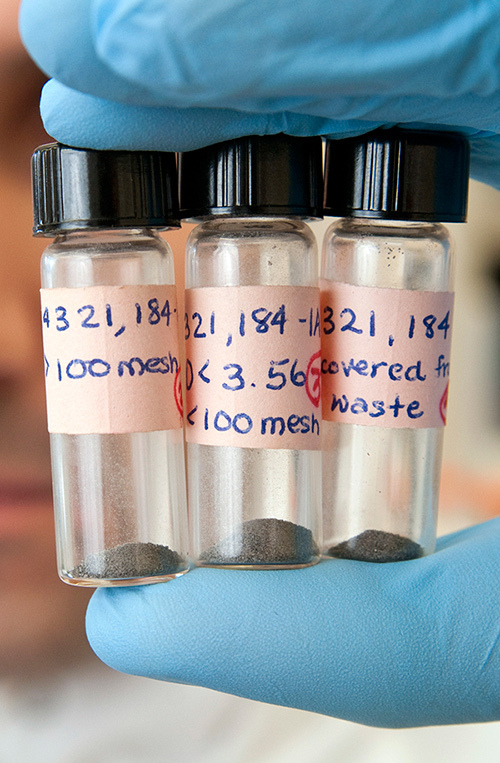 Nicolas Dauphas holds vials of moon material from Apollo 14. In their new study of the moon’s origin, he and graduate student Junjun Zhang also worked with samples from Apollo 15, 16 and 17. More questions about the impact theory come from a study published earlier this year. By looking at samples of titanium from Earth and the moon, Nicolas Dauphas, associate professor of geophysical sciences at the University of Chicago, concluded that the moon looks suspiciously like our planet. A view of the moon, with Copernicus crater seen almost edge-on near the top horizon. Copernicus is 107 kilometers in diameter. The large crater near the center is Pytheas (20 kilometers in diameter). Distance from the bottom of frame to center of Copernicus: about 400 kilometers. When titanium, like all elements heavier than helium, is forged in stellar explosions, the result is a variety of isotopes that remain distinct as they find their way into astronomical bodies, from asteroids and moons to planets. The ratio of these isotopes in a particular body is determined by what’s in the cloud of dust that formed it. Although researchers had previously reached the same conclusion based on oxygen isotopes, titanium comprises a better paternity because it is heat-resistant, and much less likely to escape as a gas. Still, the growing doubts about the conventional explanation for the moon’s existence are unsettling. If a collision with Theia did not form the moon, some old theories that have been on life support may need resuscitation, even if they also carry their own flaws and contradictions. Maybe China’s rovers and later, its sample-return missions, will answer that momentous question! Tales from the solar system: Voyagers told ‘em best!